First of all, Alaska is big. No. Like, really big. …it’s also larger than all those states combined?! In Alaska, I fulfilled a lifelong pipe-dream of backpacking in Denali National Park. Upon return I retraced my steps on the park map spanning the entire wall of the ranger station. With a quarter, I could have covered the territory it took two days and thirteen hours to travel. 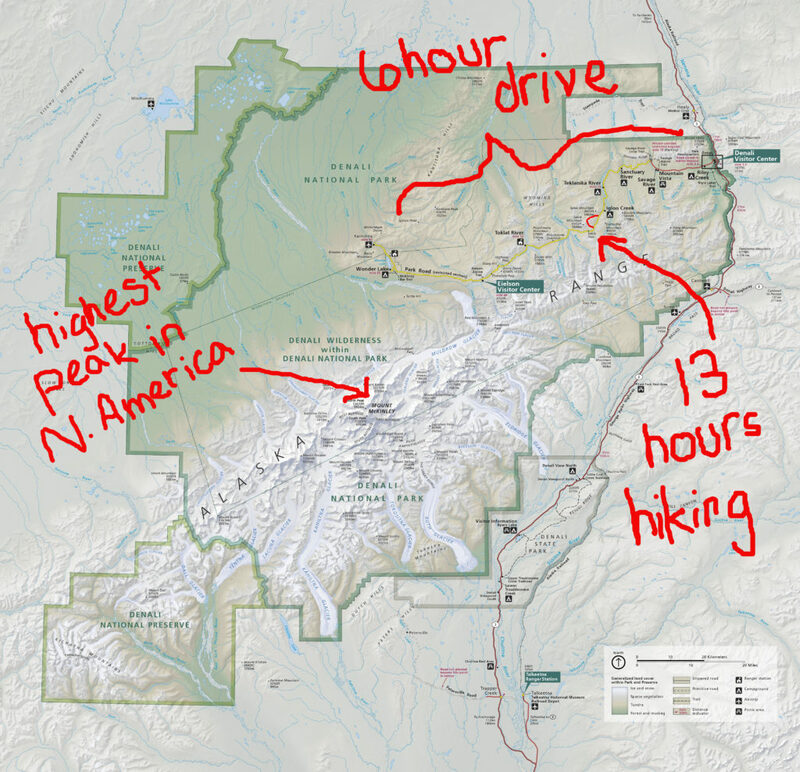 Although the Denali wilderness is twice the size of Glacier National Park and almost three times the size of Yellowstone National Park, it’s just a drop in the bucket when compared to the rest of Alaska. So when I say “the truth about Alaska,” I’m being a bit facetious. But somehow, “a few observations about the very small slice of Alaska I visited” doesn’t quite have the same ring to it. There is it. My Alaska analysis distilled into a single sentence. Given the wealth distribution in our country and the economic realities of remote places, Alaska has a whole lot more of the latter than the former. At a roadhouse one night, I sat next to a guy who builds planes and an environmental scientist who packages beer. What do they love most about Alaska? The barrier to entry (both arriving and surviving are challenging) works as a filter. Almost no one “just ended up” in Alaska. People are here because they want to be. That authenticity and courage, combined with a breathtaking and pristine backdrop, makes Alaska life rewarding in all the ways that matter most. Everywhere I turned, little elements of my past lives popped up. I kept bumping into bits of culture, vistas, and plants from my childhood in Wyoming and my coming-of-age in the Pacific Northwest. Alaska, for me, was a beautiful blend of the very-familiar with an edge of novelty and adventure. Is this love? Just like my childhood home, Alaska has Grizzlies. Lots of them. 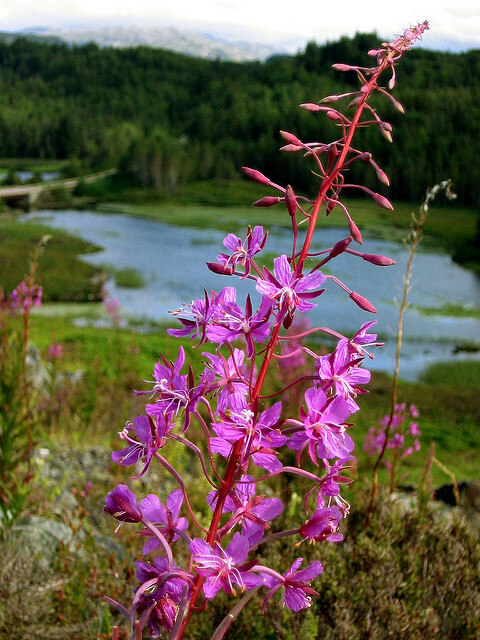 Denali National Park is infamous for its wildlife viewing. 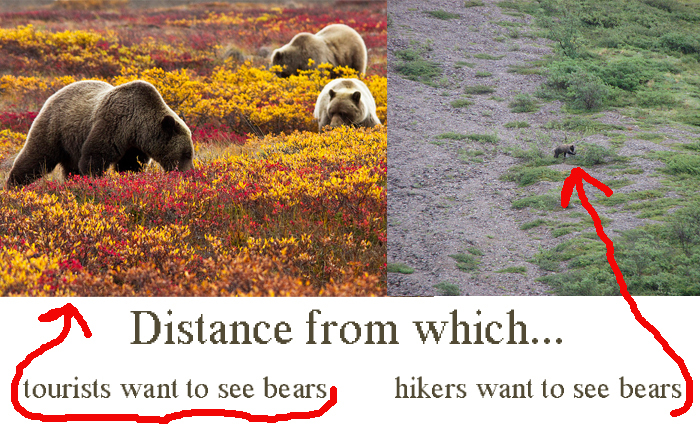 Generally, people visiting want to see bears. Heck, they want to see it all! Wolves, caribou, moose… bring it on! They do so from the relative safety of old green school buses, shutters happily clicking away. Backcountry park visitors – the kind of visitor I was – are slightly less keen. Sure, we want to experience the majesty of these creatures, but at a distance that all-but-requires binoculars, please. The managers of the park do their best to make sure backcountry visitors are armed with enough knowledge to keep themselves and the animals safe. bIf you are too selfish or lazy to participate in encounter-prevention and end up having a violent encounter, the animal will probably be tracked and killed, even if you survive. To be allowed in the backcountry, one must watch an hour-long video, listen to two safety talks, and be issued a bear-resistant food container. They can’t do anything about what happens when idiots like us fail to follow their advice. Work-exchanging on a farm was the anchor of my Alaskan days. Great people, all the microgreens I could eat, having my own little tiny house on the property, being surrounded by gardens and the Alaskan woods… heaven! 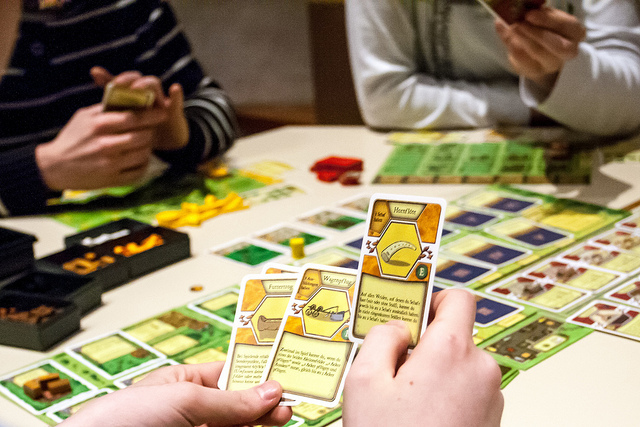 The owners of The Grove – permaculture farm, event venue, lodging provider – love a strategy-heavy table-top game called Agricola. Generally, I’m not one for spending my mental energy on imaginary variables, but how could a boot-strapping farm girl resist a game that brings the realities of homesteading to life? One non-Agricola night, a bearded dude walked into the Grand Hall – the common building where we all eat, hang out, play games, do yoga, internet, and in my case lay stretching on the floor. A friend of the owners, I found out he was a living version of the game we all loved to play. His homestead is 150 miles from the nearest road and 70 miles from the nearest collection of buildings around a community airstrip. He allowed me my typical interrogation as we flipped through photos on his tablet. He and his partner milled all their own wood on-site to build a cabin on the property, all while living in a teepee in bear country. They flew in Icelandic horses and now run a small business – Apricity Alaska – catering to bush hunting parties and other wildland adventurers. Turns out I’m not the only one impressed with his ingenuity. I’d find out later, from others, that he’s also featured on a television show. Since he didn’t mention it, I won’t reveal which one. To me, the extra daylight didn’t feel much different. Instead, I finally got to experience the afternoons I’ve always longed for… full of as much time as we all wish we had. I can’t tell you how many times I glanced at the clock and found it was hours later than I thought… 5 or 6 p.m. instead of 1 or 2 in the afternoon. I thought the extended daylight might be mind-blowing. Instead it simply made up for the poor time-estimating skills most of us employ. I didn’t have extra time, but I finally had enough time. The insane sunlight also makes plants really happy. Right before leaving, I got to see the state fair’s ridiculous prize veggies that grow in 24-hour sunlight. 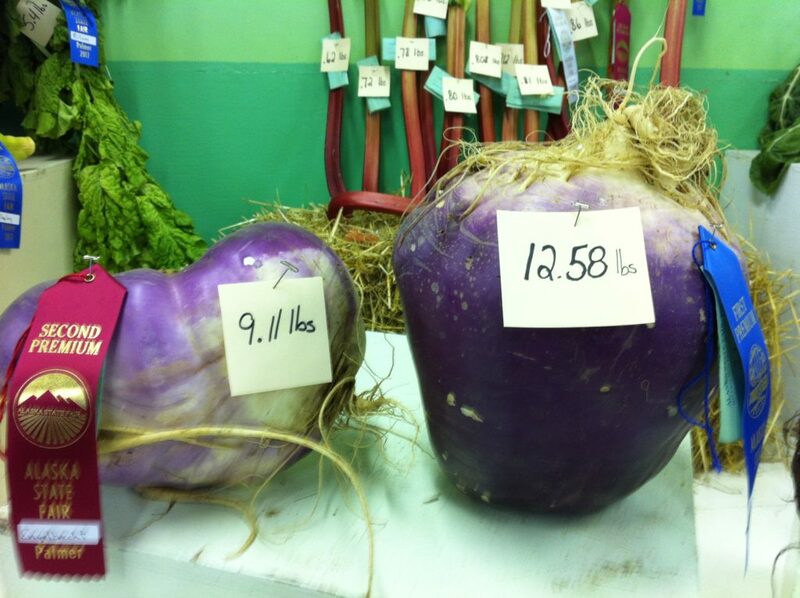 Turnips are normally the size of an orange and weigh around a pound. I can confidently claim this won’t be my last trip to Alaska. I’m definitely open to moving to the final frontier in the next few years! b. ↑ If you are too selfish or lazy to participate in encounter-prevention and end up having a violent encounter, the animal will probably be tracked and killed, even if you survive. Hi Jenna, i read some of your adventures.We can say that you´re more than a couple of times reborn.That makes you a good company to be with while travelling. Thoes people from the I.R.S. don´t know much about being over the rate of quality living standars. Annonuce yousrelve if you ever come to Germany. The country needs smart people. You better come down in one piece. “Ich drucke die Daumen”!That expresion blows my mind. It means lietrally “I press the fingers” .wehre???? I don´t get it. I guess one to the another , but that´s crossing the fingers!!!! Which day are you climbing? Hi Jema.I know that when you´re in Delani Park you have to keep yelling evry 10 Minutes to scared the bears or something like that (my common sense tells me to do the oposite).Also be aware when ist moisty because they appear more frecuently .Do you think is so deangerous.I am going to take the trip but i really want to know how far or close from the truth the advices are. Hey Jorge – did you read the story about my Alaska hike – Traveling in a Bear-Infested Wilderness? I know what you mean… drawing attention seems counter-intuitive. But the reasoning is that it will prevent bears near enough to attack you from being surprised and more likely to attack, and that bears farther away are going to be too busy eating to worry much or be curious about a far-off noise. Yes, I think it is dangerous to hike in Denali. But not so dangerous that I wouldn’t go again. I would probably not return to Unit 29 – it’s a grizzly bear epicenter. Wonderful to read of your adventures in Alaska…, must go on my bucket list. Norway, up and down the coast in winter then northern Finland with my friends for Christmas and New Year. Promised sighting of Northern Lights. Wondering how I will find the very short daylight hours…great contrast to your Alaskan days. Finishing of with time in Vienna and Budapest exploring art galleries, museums and as many concerts I can find. Settled into my apartment, loving the new way of living. Still more to sort and discard responsibly.